My friend Jason is going back to Iraq in August. The last time he was there I scoured the Associated Press photos every day, hoping he’d be that soldier taking a break sitting on the tank or whatever the guy in the photo was doing, hoping he wasn’t the guy under fire. Whenever there was a story on the Ohio wire about a soldier being injured, or worse, I felt sick to my stomach and held my breath until I saw the name. I worried worried worried until he came home. I caught the tail end of a clip on the news at dinner one night, and I thought I saw him. I rushed back to work to ask a coworker to find the clip so I could use his earphones to listen, and … I may have sat in the newsroom and cried a little when I saw him. Last time, I didn’t write nearly as often as I should have, and I still feel horribly guilty about it. This time though, I will write, and I will send packages when I can afford it, and this photo will sit on my desk to remind me to be a better friend. 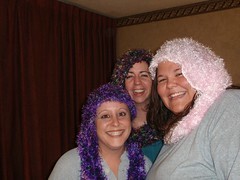 So, last weekend Jenn and I met Mary Beth in Akron so we could go see “Twilight” together. The weekend kicked off with Jenn driving to my house, then we went shopping, and Jenn got a tattoo. I did not expect to spend four hours at a tattoo parlor, and neither did she, but we did, and it was kind of interesting. After that, we went back to the house, Dave picked up a pizza, and we played Harry Potter Scene It? Yes, I won, but I was behind for a while. Saturday morning Jenn and I headed to Akron. We hung out with my sister for a while, then MB got there so the four of us hung out. Then we quickly checked into the hotel and scooted off to the movie theater. After the movie, and after I cleared the car of snow, we had dinner at … where the hell did we eat? Applebees maybe. Then I cleared the car again and we went to Wal-Mart. At some point we also went to the grocery store, but honestly, I don’t remember when. Once back in the hotel room, much drinking, taking photos and listening to music ensued. Jenn gave us each a Magic Scarf, slippers and a couple other things, and I think it’s safe to say that we had a little too much fun with the scarves. I think it’s also safe to say that I was loaded. Lots of laughing, complete with snorting. Oh, we also called Jeff and bothered him for about an hour. Sunday morning we checked out, had breakfast with Kim & Charles, and then we all headed back home. And no, no hangover. Just an upset stomach from eating too much crap. And … that’s it. So much fun! I’m thinking we should do it again, like the last weekend in March. Or something like that.